There is a weight gain sleep apnea connection. The condition is more common in people that are overweight or obese. Pregnant women are vulnerable, too. Snoring is commonly found in people who suffer from apneas. Although not everyone who snores has difficulty breathing, when obese or overweight patients report being bothered by snoring, apneas are often found in sleep studies. There are three types recognized by physicians. They are obstructive (OSA), central (CSA) and combined. OSA is most common. The muscle tone of the body relaxes during sleep. The soft tissues of the throat and upper airways can become too relaxed, causing them to collapse inward and obstruct breathing. In overweight and obese people, there are more soft tissues surrounding the airways and often poorer muscle tone. The symptoms of OSA include loud snoring, restless sleep or frequent waking and sleepiness during the day. Home tests or observation in a sleep clinic can be used to make the diagnosis. There may be no weight gain sleep apnea connection if the diagnosis is CSA. In “pure” CSA, the brain’s respiratory control centers do not work properly. The normal signals to inhale are absent. People don’t stop breathing entirely, but respiration may be shallow and several breaths may be missed. In some cases, a person must wake up in order to breathe. The combined type typically begins as OSA and progresses to CSA. Researchers are not sure why the progression occurs, but they believe the result is due to changes in blood pH levels and high CO2 blood levels. People with OSA, CSA and the combined type have an increased risk of heart disease and ultimately heart failure. High blood pressure is often found in people suffering from apneas. If blood CO2 levels become too high or oxygen levels become too low, sudden death can occur. So, there are many risks. Early diagnosis and treatment are the most effective ways to reduce the risk. The weight gain sleep apnea connection is something of a vicious cycle. Being physically inactive often leads to obesity, OSA and difficulty sleeping. Lack of sleep can lead to physical inactivity and metabolic changes that increase the risk of becoming obese. As with many other conditions, it “feeds” on itself. Observations in the clinical setting show that people with CSA make no attempt to breathe. In OSA, there is an obvious attempt to breathe. The patient appears to be struggling to take a breath. In the combination type, there are periods where the patients seems to be struggling, as well as periods when there is no attempt to breathe. The most common treatment for all types is a continuous positive aware pressure device or CPAP. Lifestyle changes, including dietary changes and increased physical activity should be considered in all cases. Attempts to sleep on one’s side, rather than the back, as well as sleeping in a reclined position, rather than flat on the back, are beneficial for OSA and CSA. A special sleep apnea pillow and other accessories are sometimes recommended, as well. If there is no weight gain sleep apnea connection (if a person is not overweight or obese) an oral device or snoring mouthpiece may be used to shift the jaw forward and open the airway. The devices are fit by dentists specializing in sleep disorders. One study1 indicates that the weight gain sleep apnea connection is strong enough to merit treatment for the apneas as a solution for combating obesity. 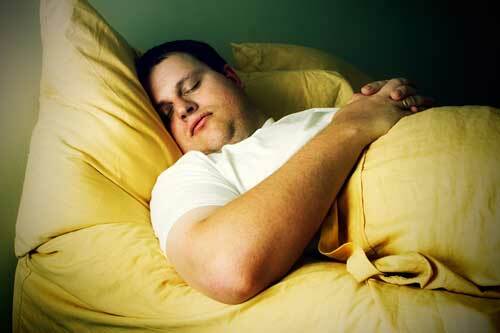 News reports recently focused on findings that people who have little difficulty sleeping are rarely obese. People, who have difficulty sleeping for a full 8 hours, are more likely to be overweight. So, there is a clearly defined weight gain sleep apnea connection. Correcting one problem could help correct the other.